← Monique Miller. The Marrying Kind. Deer Park, NY: Urban Christian, 2012. Elizabeth Craig. Quilt or Innocence. New York: Signet, 2012. All Beatrice Coleman wants is a nice, quiet retirement. Now that she’s moved to small town Dappled Hills, North Carolina she is closer to her daughter, Piper, and has plenty of free time to catch up on her reading. Beatrice has visions of spending her days lying in a backyard hammock sipping leisurely on a mint julep. Almost immediately, Beatrice’s fantasy is interrupted by her intrusive next-door neighbor, Meadow Downey, who barges in and forces Beatrice to attend one of her Village Quilters guild meetings. Although Meadow pulls her into the group, Beatrice is reluctant to get involved. She didn’t come to Dappled Hills for the company. Prior to her retirement, Beatrice worked as a folk art curator in Atlanta. Coincidentally enough, she is familiar with all of the technical details of quilts and has even appraised some in the past. But Beatrice has never attempted to make a quilt herself – nor did she have any inclination to. Quite frankly, she resents been torn away from her sweet corgi, Noo-noo, and her current read, Whispers in Summer. Before she can say “backstitch,” Beatrice is embroiled in the local quilting scene, and all of the drama that comes with it. She learns quickly that the beloved Patchwork Cottage, which supplies all the town quilters with material, is set to close. Most of the guild members support Posy, the shop owner, and a couple members implore her to stand her ground against Judith, her landlord. Judith is forcing Posy out by raising the rent. Surprisingly, Judith is also a quilter and active with the guild. Despite the shared hobby and associations, Judith is interested in launching a high-end women’s boutique in the space, which she believes will be a more lucrative venture. Judith is not exactly popular in the guild. Fellow members tell Beatrice how Judith often stoops to blackmail and delights in meanness. The night of a quilting bee, for instance, Beatrice catches Judith in the act of ripping off another member. More than a few people wouldn’t mind Judith gone, obviously. When she turns up dead the morning after the quilting bee, fingers point in every direction. Many possible motives arise and novelist Elizabeth Craig believably shifts among all of the reasonable alternatives. Just as Beatrice fell into the Village Quilters guild by accident, so too does she become embroiled in the mystery of Judith’s murder. Beatrice asks lots of questions and uncovers a number of intriguing, if not incriminating, tidbits about the guild members. Although Beatrice doesn’t claim to carry on an investigation, her sleuthing clearly rattles the murderer, who leaves threatening notes on her doorstep stuffed inside of empty Nehi bottles. Even with the prospect of continued and escalated threats, Beatrice does not cease asking questions nor remove herself from the case. She’s in too far now to stop – with the murder and the quilting. As Beatrice probes further, she realizes that maybe she didn’t want the sleepy retirement she hoped for all along. Much like one of the quilts Beatrice admires in the novel, “It looks like a quilt to curl up in on a cold night. With a mug of hot chocolate,” Quilt or Innocence, is a comfortable, engaging read. Although Meadow is the designated eccentric oddball of the bunch, Craig delivers many distinctive characters. At the end of the book, Craig rewards readers with quilting tips and four tempting recipes. 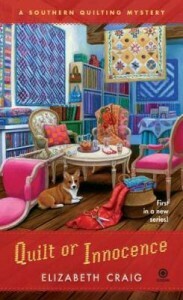 This is the first book in Craig’s A Southern Quilting Mystery series. For readers who want more: the second book in the series has been released and the third will come out in December of this year. We previously covered one of Craig’s books in her Myrtle Clover Mystery series, A Dyeing Shame.